TC CORE are for sensors up to 2/3” feature a truly revolutionary ultra compact opto-mechanical designThese lenses deliver high-end optical performances and at the same time are up to 70% smaller than other double-sided telecentric lenses on the market, thus allowing to significantly downsize a vision system. The unique shape has been expressly developed for maximum mounting flexibility. 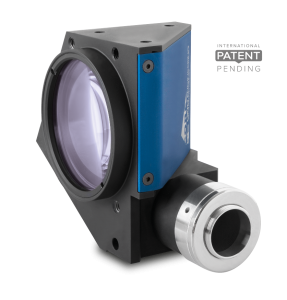 TC CORE lenses can be mounted in different directions using any of the 4 sides even without clamps, allowing to cut the system’s cost, and can be easily fitted or retrofitted even into very compact machines. TC CORE bi-telecentric lenses can also be coupled with the new ultra compact LTCLHP CORE series telecentric illuminators to build super small yet extremely accurate measurement systems. TC CORE bi-telecentric lenses deliver excellent optical performances as other comparable Opto Engineering bi-telecentric lenses. TC CORE lenses are up to 70% smaller than other telecentric lenses on the market. TC CORE lenses integrate a camera phase adjustment and can be mounted on multiple sides with or without clamps, allowing to cut the costs. Systems integrating TC CORE lenses take much less space,resulting in lower manufacturing, shipping and storage costs. The long side of sensor has to be aligned along axis B(position n°1) or axis A (position n°2).